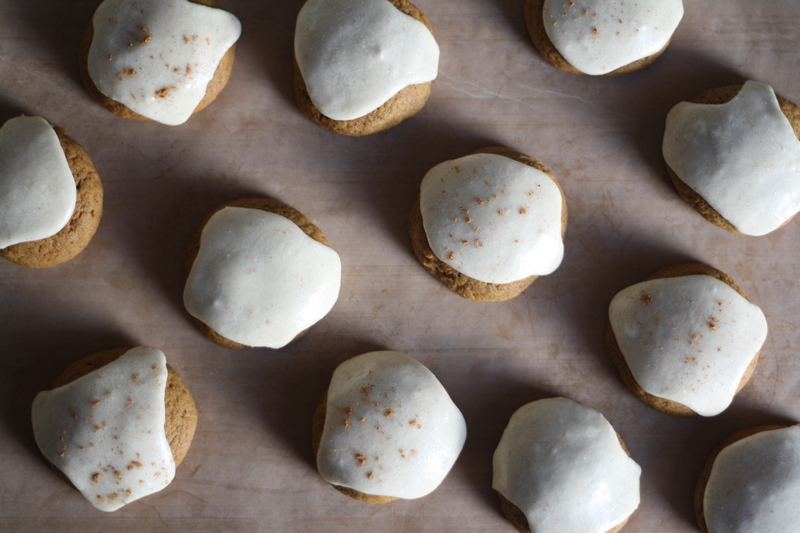 …or rather I spent the last few weeks developing this recipe for the perfect pumpkin cookie (if only that was true about life)! For this project I went in with a few specific goals. The first was height. Most pumpkin cookies spread out while baking (because of so much liquid in the pumpkin) but I wanted a cookie that remained thick and didn’t spread too much in the oven. Point two was that they should be soft and cakey, but not too soft or too cakey. 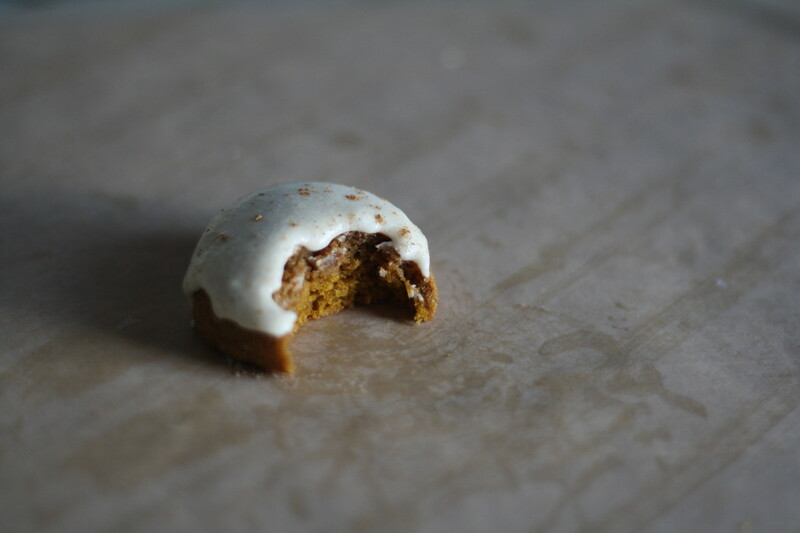 I know, I have high cookie standards and am like Goldilocks when it comes to baking, but have you ever tried to eat a pumpkin cookie and it crumbled in your hands? Not fun, especially if it is topped with any type of glaze and you are around anyone else but yourself. Next up was just a personal preference but I wanted a recipe that didn’t yield 6 dozen cookies, which let me remind you is 72 cookies! So many pumpkin cookie recipes call for the whole can of pumpkin but unless you are attending a bake sale, or a huuuuge party, or have an endless collection of storage containers, then a dozen or two is usually just the right cookie amount. But what do you do with the rest of the can? It will last in the refrigerator for a week and can be frozen for 3 months. My friend was telling me she freezes extra pumpkin in one cup measurements so you always have a little pumpkin on hand and once you start thinking up ideas – pumpkin scones, pumpkin donut muffins, pumpkin waffles – that extra can will be gone in no time! Lastly, let’s talk about glaze. The cookie alone is not super sweet and the glaze is really what makes these cookies shine – and it’s pretty hard not too with brown butter and apple cider. 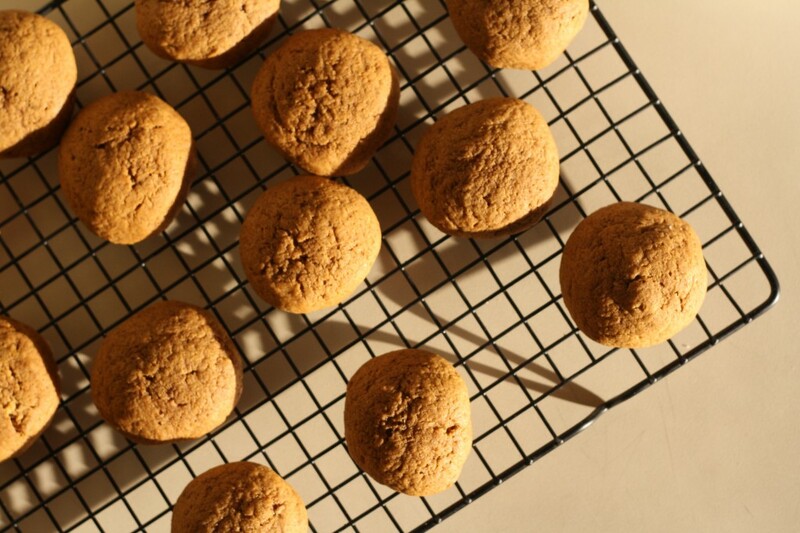 This my friends, is my new favorite pumpkin cookie recipe. One indication is that I can’t stop making them. 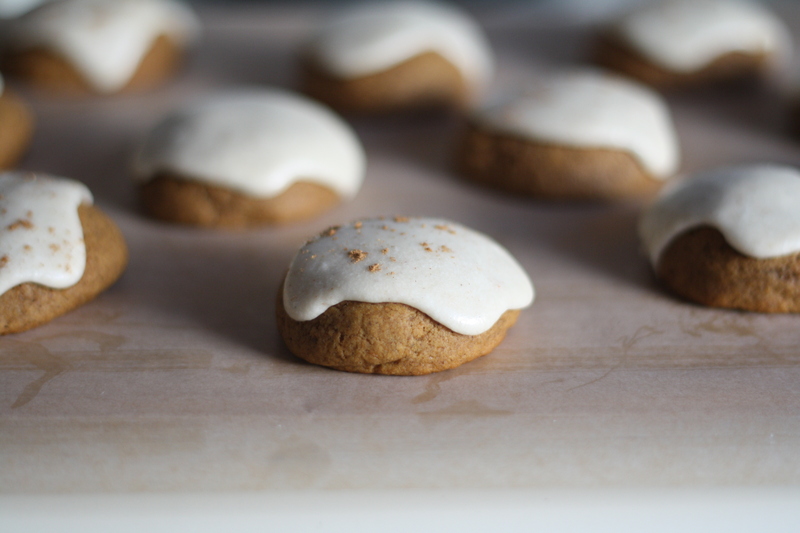 Usually I make a recipe one or two times and then move on, but when I got this one right, I can’t stop with the pumpkin cookies. I finally found my pumpkin cookie dreamboat. 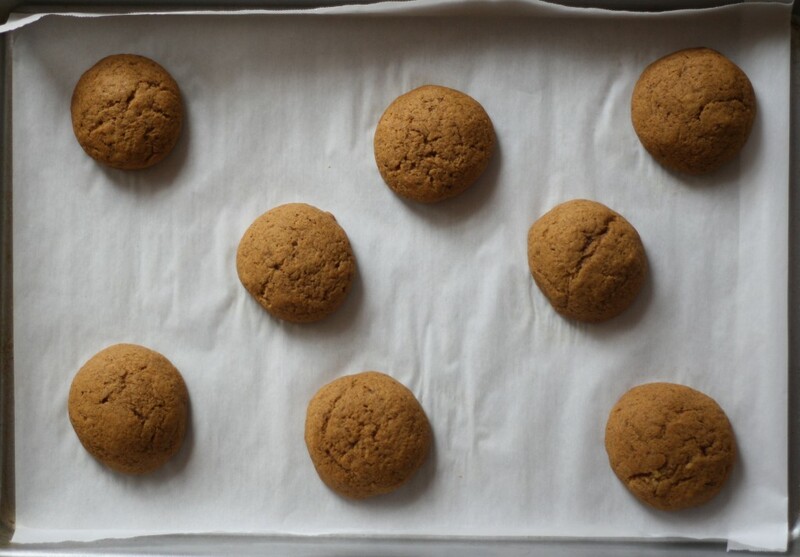 Make the cookies: Brown the butter by cooking the butter in a medium saucepan over medium heat. It will begin to foam but keep stirring constantly and scraping up the bits on the bottom until the butter is golden brown and smells nutty and delicious. 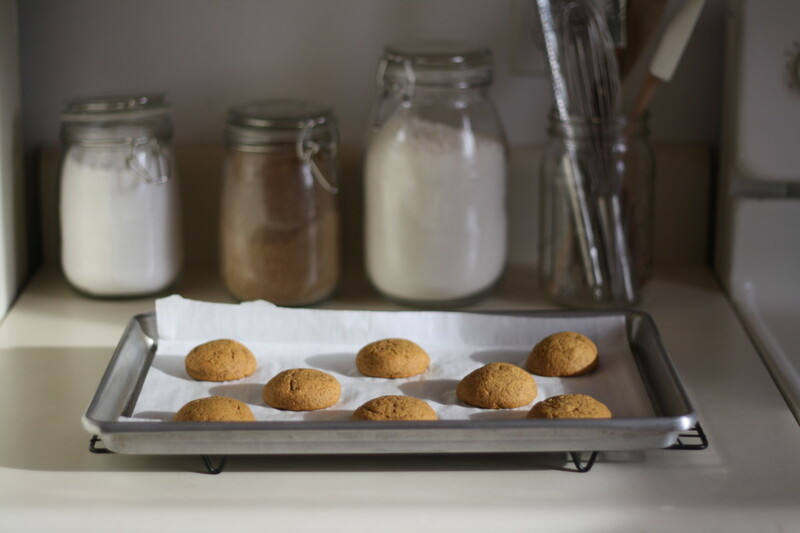 Turn off the heat and transfer – little brown butter bits and all! – to a liquid measuring cup. You will need 1/2 cup of brown butter for the cookies and the extra will be used for the glaze. Measure out 3 tablespoons (or so) of butter into a small bowl or until the butter remaining in the cup hits the 1/2 cup mark. Make sure to stir up all the brown butter bits when measuring to get the most flavor. Let the butter cool for about 20 minutes, or until it is no longer warm to the touch. Meanwhile preheat the oven to 350 and line a baking sheet with parchment. Set aside. Whisk together brown sugar, baking powder, baking soda, salt and spices in a medium bowl. Whisk in egg yolk and vanilla. Add pumpkin purée and mix until combined. Stir in 1/2 cup cooled brown butter. Add flour and stir vigorously until no streaks remain. 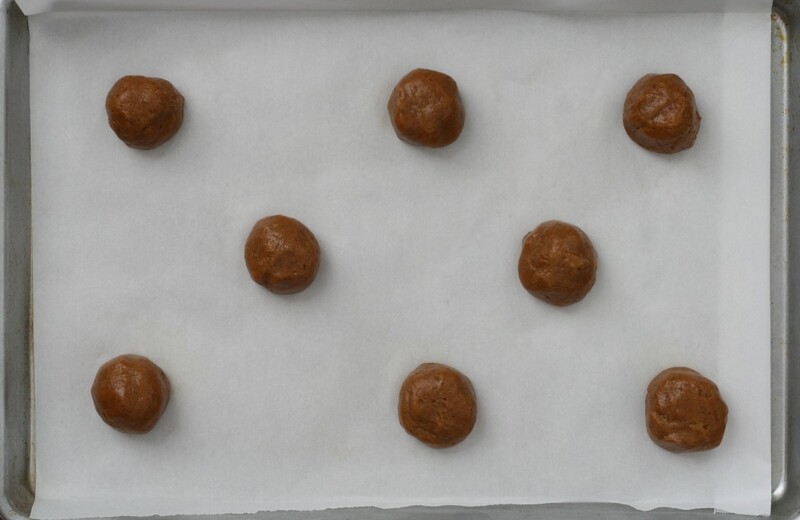 Scoop dough into small balls, roll between your palms until smooth, then place on the prepared sheet. Bake for 8-12 minutes or until the tops are set. Let cool on the pan for several minutes before transferring to a wire rack to cool completely. Make the glaze: Use a fork to stir the powdered sugar into the small bowl of brown butter. Add a pinch of salt and vanilla. It will be crumbly but don’t fret. Stir in 1 tablespoon cider (or milk). Use a whisk as it begins to thin out to stir out any lumps. Add cider 1 tablespoon at a time until the glaze is smooth and spreadable. Spread over the top of each cookie and sprinkle with a pinch of nutmeg if desired. Let stand for 15 minutes or so until the glaze has set. Store loosely covered at room temperature. *The spices can also be replaced with 1 1/2 – 2 teaspoons pumpkin pie spice. **Wondering what to do with the rest of that can of pumpkin? How about a batch or two of boozy toasted marshmallow pumpkin shakes or maybe a pan of pumpkin and burnt sugar shortbread squares. Leftover pumpkin may also be stored in a well-sealed container (it is best if you remove it from the can first) for one week in the refrigerator and up to three months in the freezer. These cookies look like my kind of dessert! With a pumpkin spice latte you have an unbeatable fall taste treat! I’m making a batch for the weekend. Wow! 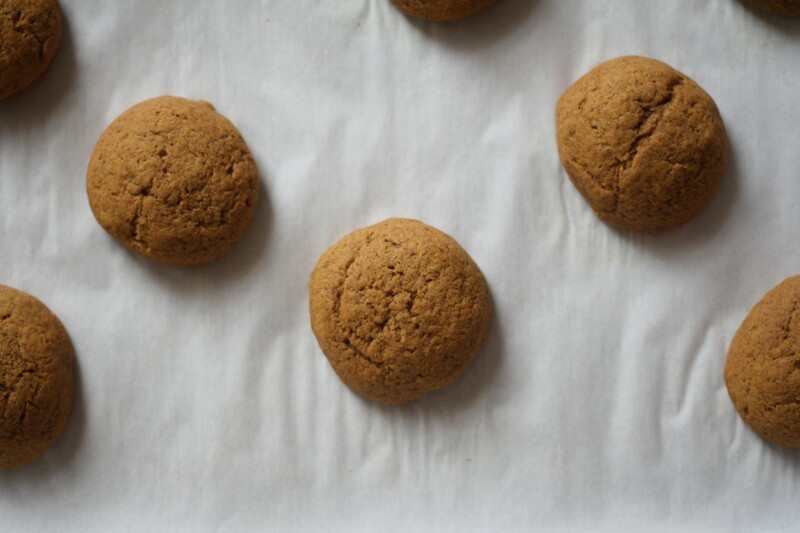 I added some cardamom (because I love cardamom) instead of cloves (because I didn’t feel like grinding them up), and these are just the most amazing cookies with pumpkin flavor I have ever had, This is a keeper. Kind of sad only makes so few, though:-) my cookies came out light, and fluffy, like little clouds. Neither spongy or breach…light and airy. I meant bready, not breach. These sound like autumn perfection! Definitely adding to my fall baking list. Thank you! Love the cookies and love the glaze. These sound awesome! These look amazing and I am keen to try them but I have a question about canned pumpkin purée. We don’t have this in Australia. Is it just pumpkin or does it have anything added to it, for example sugar? And is the texture quite dry? Hi Elizabeth! The pumpkin purée in this recipe is 100% pure pumpkin, with no added sugar or spice. It is sold by the can here in the US but if you can’t find it then the next best method is to make your own! Cut a two-pound (or thereabouts) pumpkin in half, scoop out the seeds, and place the halves face down on a buttered baking sheet. Bake for about 30 minutes or so at 375 or until the pumpkin is soft. Let it cool, then scoop and use! Happy baking! Thanks, I have half a large pumpkin in my fridge right now ready and waiting! These are the cutest little cookies perfect for holiday baking! They look so soft and I can just imagine them warm and smelling like cinnamon…mmmmmm. Yum! I LOVE these cookies! The pictures are a great indicator for knowing when to bring the cookies out of the oven b/c I had to leave mine in the oven for 14 mins. in order for them to be a similar color to your cookies in the pictures and be ready to pull out. Thanks so much for sharing your recipe! Keep up the great work. Yay! So happy to hear they were a hit! 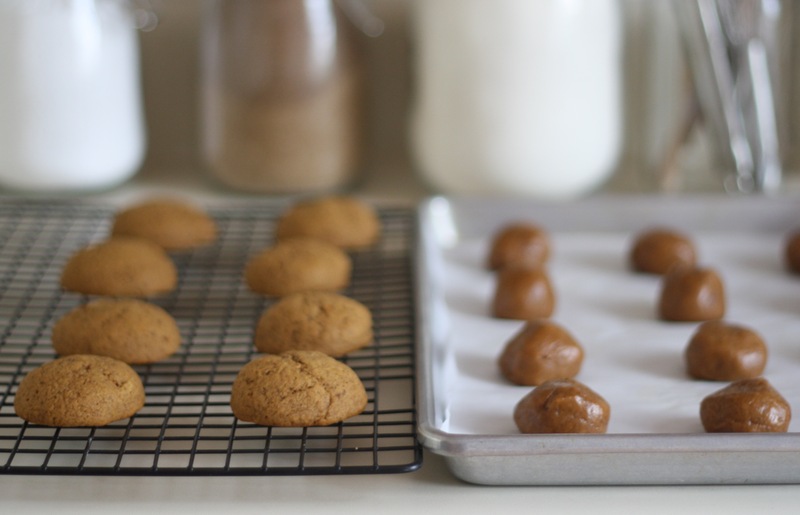 i just discovered your blog (by way of smitten kitchen!) and i love it! the pictures are beautiful, and this recipe immediately stood out. i pinned it and can’t wait to make these in the fall! Hi Chaya! So happy you found me and hope the cookies are enjoyed this fall!